Traditions have always been a huge part of my life and something I hold quite dear to me. In fact, as a young child, if a tradition was interrupted in any way I may have thrown a minor tantrum. Messing with my traditions (especially around the holidays) was not something I took lightly. Perhaps that is because my mother always made sure that holidays were special. Christmas was no exception. For the better part of my young life, I knew what to expect out of Christmas - whether spent in Florida or Alabama. It was always spent with my grandparents whether we went to Alabama the day we got out of school for break or they drove down to Florida. We always baked oatmeal scotchies and tried unsuccessfully to keep my grandpa out of the kitchen during the process (and away from the cookie jar thereafter). The tree would be LOADED with gifts and I always took the liberty of counting how many gifts I had. Hey, what kid doesn't? Christmas Eve was usually spent at a Christmas Eve candlelight service followed by driving around looking at lights. I used to love driving around the historic section of Hartselle or Decatur to admire their classy decor. We'd usually have some delicious finger foods accompanied by hot chocolate Christmas Eve night and then we would exchange gifts among each other. Christmas Day was usually reserved for the Littles - which for the longest time was just me. "Santa's" gifts would be wrapped under the tree, stockings would be full to overflowing, and a delicious breakfast would be made. We would spend the day with each other, figuring out the gifts we received, playing with new toys, and simply having a great time. As years went on, we sometimes added baking a small birthday cake and singing "Happy Birthday" to Jesus. I've carried on the tradition of making homemade sourdough bread. My mom used to make it every year when I was younger and when I got married, I took the tradition over. There's something special about that first batch of bread fresh out of the oven. There are many traditions that we have decided to start as our own little family and I'm so excited about them. We did start the Elf on the Shelf but it's turned into more of a prolonged "hide and seek" and just something fun we do for Gabe. He enjoys looking for him each morning. We don't tell him that he'll go tell Santa about his behavior and we don't do the whole "Santa won't bring gifts if you're bad" deal. It's not about that. He will get gifts because he is loved. Simple. Jesus gave us the gift of Himself and salvation simply because we are loved. It has nothing to with how good or bad we are. We are also going to leave a "Santa sack" on Christmas Eve under the tree full of toys for other underprivileged kids so Santa can take it with him. I think we may tweak the Santa story a bit and tell him that Santa actually relies on us to help him get gifts to those who wouldn't otherwise get gifts on Christmas. We started one Christmas book a night on the 1st but that hasn't quite worked out the way I anticipated. And you know what? That's okay. Sometimes things don't turn out the way we plan around the holidays and it's important to remember that ultimately, it's not about making everything perfect. It's about being together. Sometimes cats will get their fur all over your tree skirt and sometimes presents won't be wrapped perfectly and Christmas lights will burn out (evidenced by our currently half-lit tree at the moment), and occasionally the busyness of the season will completely overwhelm you and cause you to turn into this raging, moody person that you do not recognize or like very much. It's then that you have to stop and remember: none of that really matters. Jesus matters. Jesus who came as a baby and 33 years later died for us - despite our selves. It all boils down to Jesus. Just Jesus. He's the reason....not just for the season, but for each day of the year. What I think I love most about Christmas time is that the rest of society tends to join in with the giving and the sharing and the caring and the loving more so than the rest of the year. For a few weeks, it seems like the world is sort of how it should be. And then the packages are opened, lights come down, trees get packed away or thrown on the front lawn and people go back to their normal selves. That's why I hate to see Christmas leave. If only the Spirit of Christmas would last all year through - - - that would be a tradition worth fretting over. 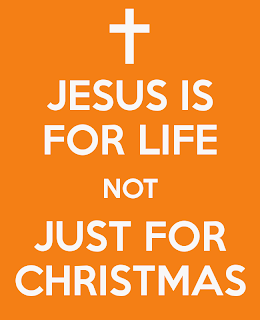 So while you celebrate with friends and family and enjoy the company of the people you love most, remember that it's not about wrapped presents, twinkling lights, St. Nick, or snowmen - it's about Jesus. 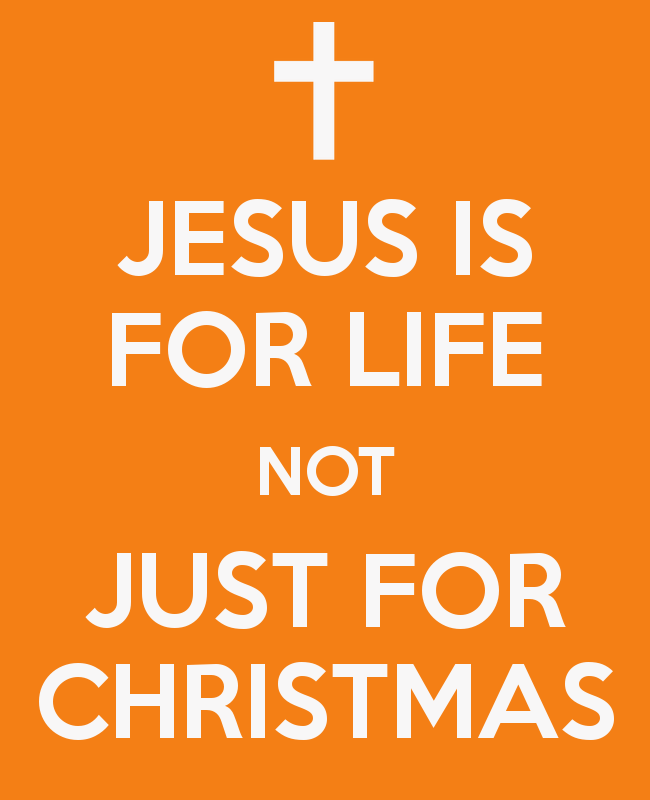 The other stuff is great and fun and I'm totally into all of it - but it's all about Jesus - all year through. Thought this said it perfectly. We hosted Thanksgiving at our house for the first time in a long time. Our first year we were married we hosted it but it was just my mom and my Pop & Nana. This year, I didn't spend it with any of my family, which is odd. Felt weird not seeing them or even my mother at all. But, despite the change in venue and company, it was a really nice time. We hosted for hubby's family, although I don't feel like I did much. My mother-in-law did most of the cooking at her place. I just made the mac-n-cheese (which apparently wasn't cheesy enough for my crazy picky brother in law-ha! ), baked the homemade sourdough bread, and hubby made a melt-in-your-mouth delicious pumpkin cheesecake. We had a ton of food and quite a few laughs. Then my b-i-l and s-i-l willingly took our boy with them to see her side of the family which gave hubby and I a chance to try our hand at Black Friday Thursday shopping. I have to admit, I was a bit nervous standing in the 18 mile long line outside of Toys-R-Us. I swore a few years ago that I would NEVER do Black Friday shopping again. And then....I had a kid. Oh, the things we do for our children. We had a very specific door-buster item we were getting and thankfully I snagged a ticket for it before even entering the doors so all I had to do was maneuver the throngs of people to find the other items I was searching for. Thank God for bonus checks! This is the first Christmas that our boy understands what it's all about pretty much and it's also the first Christmas that we've actually been able to afford stuff. I am so super stoked. I'm excited to start new traditions this year and I so cannot wait to see his precious little face on Christmas morning when he sees what he has under the tree! That's part of the magic...the littles! This whole season, while it can become stressful and busy and filled with way too many things than one can truly accomplish, is exciting to me. My husband and I love this time of year - everything about it. It's the season of shopping and spending. It's the season of giving and receiving. It's the season of sleigh bells and twinkling lights. But most importantly for me, it's the season of thanks. Oh, my....I have so much for which to be thankful. I am most thankful for the fact that I have a Savior Who willingly came down from Heaven and was born as a little baby to be my King and one day die for me. I mean, WOW! Talk about humbled! I have so many blessings in my life and if I tried to name them all, you would be reading forever. It's easy to get overwhelmed by the small, minute, honestly insignificant details that go along with this season but I encourage you to keep in mind the real reason. Thanksgiving is not just a meal. It's not just the day before big shopping (or I suppose now the day OF). It's not just one day out of the year. It encompasses the beauty of what this season and our entire lives should be about: being thankful for what we have and who we get to share it with.